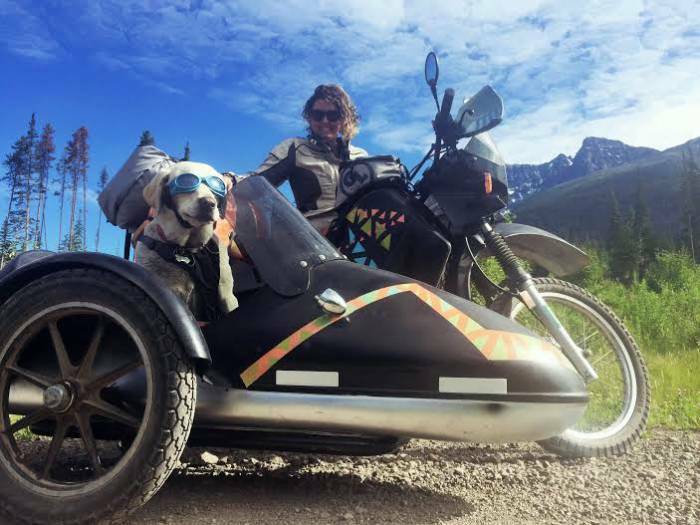 When wanderlust struck this GearJunkie contributor, she fired up her motorcycle and tucked her dog in a sidecar. 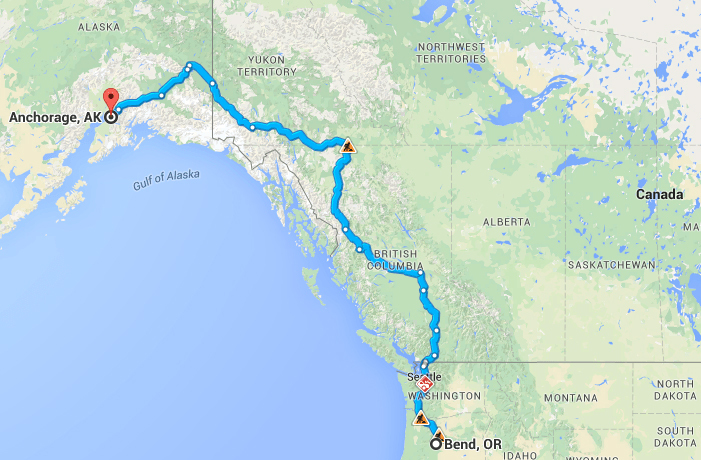 Alaska or bust! I’ve always wanted to drive to Alaska, and after riding dual sport motorcycles in Ecuador, that dream morphed into a motorcycle trip to the far north that I’ve dubbed Operation Moto Dog. There was one problem. 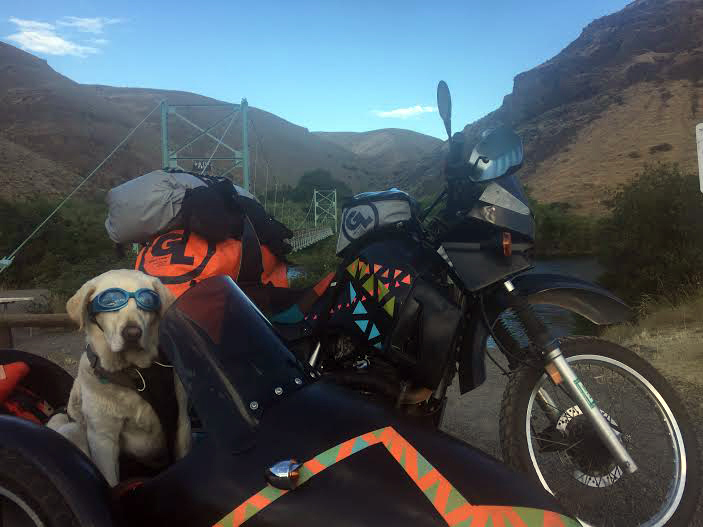 My dog, Baylor, is my adventure buddy and constant companion. I simply had to bring him along. So I scoured ads and found a used sidecar, then a used Kawasaki KLR650. I took a welding class, learned to metal fabricate and spent weeks in the cave designing, prototyping and building a subframe on the bike to connect the sidecar. Custom paint job and upholstery completed, I christened the motorcycle Rufio. We were ready to hit the open road. 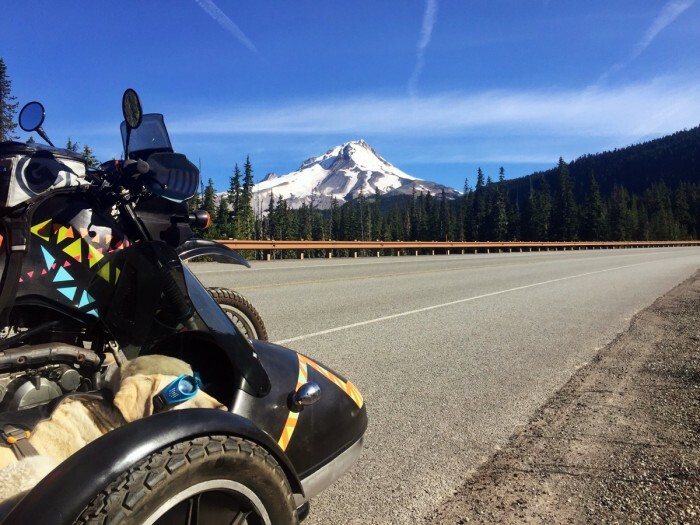 Ten days and more than 1,100 miles later, I’ve already learned a few valuable lessons. Prior to ever riding in the sidecar, Baylor spent days lounging in it while I worked in the shop. We established a routine so that once he’s in the sidecar, has his Ruffwear Load Up Harness and Doggles on and gotten a treat he’s not allowed to get out until I give him the okay. He thinks of the sidecar as his “bed” and is completely content in it for hours. He can ride comfortably for longer than I can! With no way to crank up the heat or blast the a/c, temperature regulation on a motorbike comes down to having the right layers. As we cross into the Yukon, there’s a chill in the air and rain showers are the norm. Luckily, the Zima Gore-Tex Jacket from Dainese keeps me warm and dry. And Baylor stays happy with his Quinzee Insulated Jacket and Sun Shower Raincoat, both from Ruffwear. It can be tempting to pack more into each day — especially up north where the sun hardly sets! But being tired while adventuring — especially on a motorcycle — is a recipe for disaster. One late night, I lost track of where we were on the map and then quite literally lost the map. We pulled off onto the next dirt road and as I started across a dirt-packed wooden bridge the front tire slumped down. Shining my headlight to inspect, I could see the river flowing 20 feet below. I was able to safely get off the bridge, but it was a sign that we were clearly in a mistake cascade. The best option was to get sleep immediately and start again fresh the next morning. 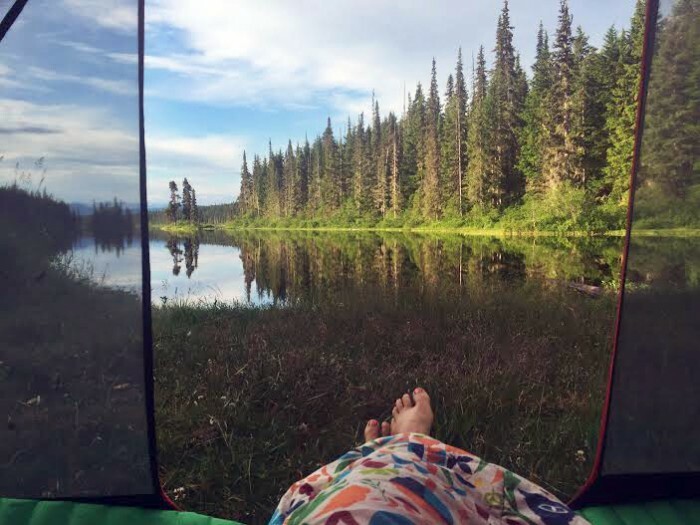 Having heard about bear sitings on the route, I wasn’t surprised when a bear lumbered 100 yards past camp on the first night in British Columbia. I felt pretty confident and calm — I had bear spray after all. And then I remembered I’d left it in the sidecar, 1/4 mile away from camp. Turns out it doesn’t do much good if it’s not with you. 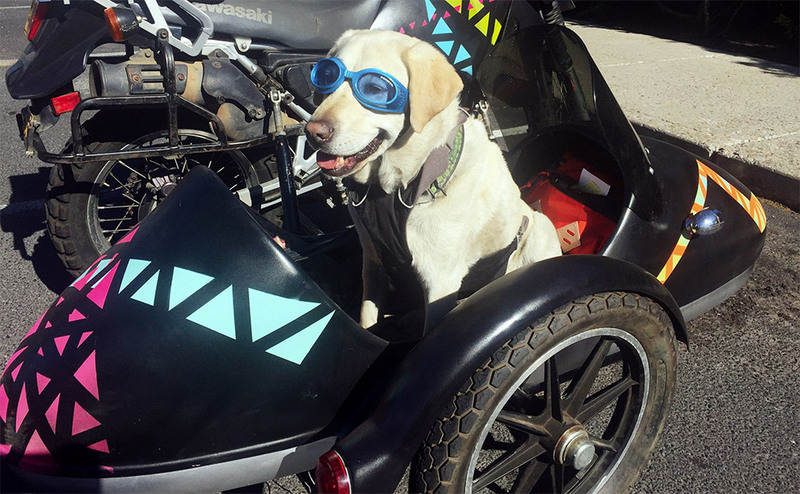 A goggle-wearing, sidecar-riding dog is a great way to meet people. And hearing about our journey prompts people to tell of their big adventure. Old, young, American, Canadian, everyone has one. The week they camped and hiked through the Cascades. That time in the army they rode motorcycles everywhere. The road trip of a lifetime they took as a family — crossing the country and hitting every roadside attraction. It’s inspiring. It’s fun. And it’s a good reminder to get out there and do it. You won’t regret it. One day it might be your favorite story. I don’t know what the next 1,000 miles will bring, but I’m excited to find out. It’s a long way to Alaska! The Stewart-Cassiar highway has been modernized, but it is still reported to be one of the most remote and rugged highways in North America. I have tools, a maintenance manual, and a can-do attitude. I hope it’s enough to get us to Alaska. –Mallory Paige is an adventurer and storyteller with a powerfully simple philosophy: Choose Happy, Seek Adventure. Visit OperationMotoDog.com for more stories from the road.